The temperature is dropping and the leaves are turning. This can only mean one thing – football season has officially begun. While most individuals would say football is a man’s sport they couldn’t be more wrong. There are plenty of ladies who cannot get enough of the rough and tumble of football so much so that they plan their weddings around the season. For all those die hard fans who are about to be get married, Bridal Party Tees has the perfect addition to your wedding! 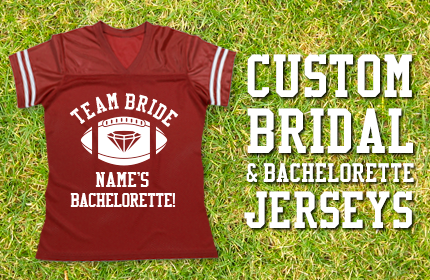 Bridal Party Tees offers custom bride jerseys that can be customized to include your wedding date and new last name. 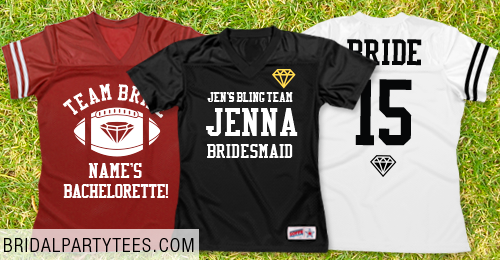 Better yet, have you or your maids rock matching bachelorette jerseys to the next game. Don’t worry fellas, we’ve got great bachelor jerseys too. Maybe you want the smallest touch added to your wedding to show your love for football. Save the date jerseys are one of the cutest and hottest trends to wear at your engagement photos! Show us your wedding game day spirit by sharing your pictures with us on Facebook, Twitter, or Instagram @bridalpartytees!